A recent New York Times article is entitled "Where Churches Have Become Temples of Cheese, Fitness and Eroticism." It's on the declining Church in Canada. Buildings that once hosted churches are abandoned due to declining Jesus-following, and in many cases are being repurposed. There are "dozens of churches across Quebec that have been transformed — into university reading rooms, luxury condominiums, cheese emporiums and upmarket fitness centers." At another event at the church, devoted to freewheeling dance, dozens of barefoot amateur dancers filled the space and undulated in a trance-like state in front of its former altar amid drums and chanting. Two men in tank tops clasped hands and twirled each other. A woman in blue juggled three white balls, putting one on her head. While the church has welcomed a “Crucifix Halloween” party featuring barely dressed, leather-clad dancers gyrating in front of a lit-up cross, its director, Gérald St-Georges, a Roman Catholic, stressed that its main function was still sacred rather than profane." St-George says, “I don’t feel any taboo in transforming a church into a theater, as we are remaining true to the church’s mission of serving the community." The transformation of a church into a theater. Or, perhaps better said, the declension, the deformation, of a church into a theater. I have a theory. 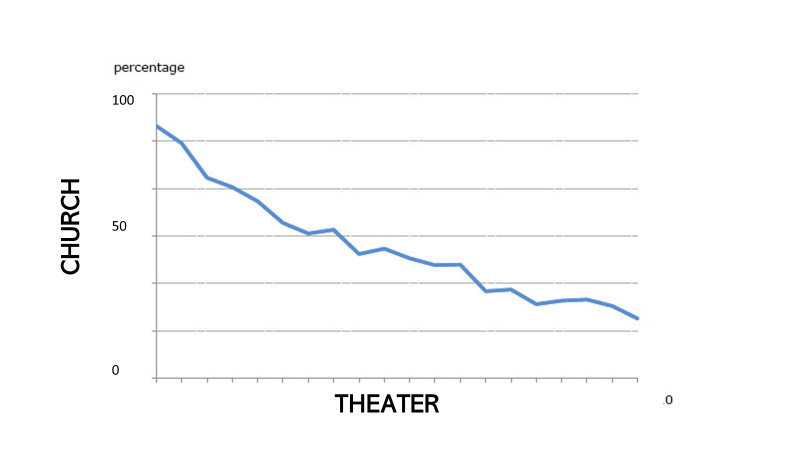 The more theater, the less church. The more staging, the less church. The more production, the less church. The more entertainment, the less church. The more audience, the less church. With this we see the evolutionary trajectory of many American churches, and their logical endpoint.